This study focuses on the opinions of external and internal stakeholders on the probable success factors that are assumed to be effective on the e-Government transformation success in Turkey. It uses a generic methodology previously developed by the same researchers to collect data from four central and four local Turkish public institutions and applies correlation analyses on the collected data to present its results. 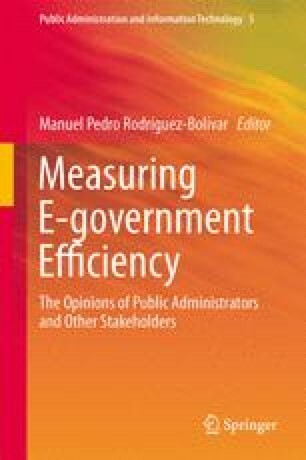 Apart from the similar studies in the literature, this study is a multidimensional quantitative one considering the technical, social, organizational, political, legal, and economic dimensions of the subject concurrently, and it uses the data of not only external stakeholders (the set of all stakeholders who only use the e-Government services provided by a public institution) but also internal stakeholders (the set of all stakeholders who only provide the e-Government services in a public institution) while doing its analyses to create an opportunity for the researchers to clearly compare and contrast the perspectives of these two different groups. See Tables 13.2 and 13.3. See Tables 13.4 and 13.5. See Tables 13.6, 13.7, 13.8 and 13.9.